Logicom have developed LogIC software to perform in an operational setting where communicating answers, in an environment of urgency, is essential. It is developed by working geologists and petrophysicists, to meet their requirements in the real world of exploration and production. LogIC evolved with an emphasis on speed, flexibility and output quality. It is also a tool for developing and testing ideas, and communicating them effectively. This characteristic has made LogIC the perfect platform for developing NMR, image analysis and waveform acoustic applications. DLIS and LIS tape/diskette reading include customisable data curve selection criteria, auto-store and batch facilities. Data files may also be output in LIS or DLIS format, and transferred to tape or diskette for distribution. Fuzzy logic for log prediction (including permeability) and facies typing. Analysis is done on a zone-by zone basis. LogIC will define up to 500 zones in a single well. Each zone can be assigned different analysis parameters, providing the facility to process geologically complex sequences in one go. Each data level can be analysed by several methods in a single pass. Assigning different equations and methods offers the flexibility to compare and contrast interpretations with minimum effort. For example, LogIC is ideal for developing moving T2 cut-offs for improved Sw interpretation, and also for customising equations for better permeability predictions. Once established, the parameters are stored, providing users with a quick way to change one or two parameters and, either rerun the analysis or re-make the plots. Parameter files are associated with a well. Specifying the well means that the data set, analyses and presentations are fully defined. When a new well is drilled, methods and plot formats used on a nearby or analogous well can be quickly and effortlessly loaded for first pass analysis. In many cases the new data can be processed in minutes. Instead of simply storing the analytical results, retains, in the parameter files, the means by which those results are obtained. This approach is both economical of disk space, and easier to track the processing strategy used for the well. All standard, and many esoteric analytical methods for clay content, porosity and water saturation are available on LogIC. A multi-mineral option provides a complex mineralogy analysis using the matrix inversion method. In addition to the standard analysis methods, users can customise existing equations, or add new ones, use the command interpreter. The command interpreter operates both in addition to, and independently of, the normal analysis. The command interpreter includes standard mathematical functions, conditional processing (IF statements) and access to many of the normal analysis procedures. In practice, the command interpreter allows users to perform virtually any analysis or data manipulation conceivable. Analytical results are presented as continuous curves of porosity, water saturation, and other information. LogIC furnishes zone-by-zone summaries of net-pay, net-to-gross ratio, hydrocarbon pore volume, as well as averaged channel data over the entire zone, or over the net-sand and net-pay intervals. The zone summaries can be viewed on screen, printed as hardcopy, or made an integral part of log-plot presentation. Automatic calculation of commonly used parameters such as Rw from SP, Rwa, m, n, and p, neutron density separation, apparent matrix density, transit time and neutron porosity and many others. Batch analysis and plotting provides the facility for processing an unlimited number of wells, without user interaction. A simple control file manages processing. Directives can be placed in the control file to modify petrophysical and other constants, so that extensive sensitivities can be run and plotted while the user pursues other activities. Collage is an editing and drawing module for the display up to 50 different well plots on one cross-section diagram. LogIC users can pick geological zones, and/or events, which may be tied across wells. Wells plots may be aligned on structural position or on geological boundaries. Numerous shading and annotation options provide a CAD-like flexibility which, allied with the powerful LogIC well plotting facilities, furnish a formidable tool for the geologist. Typical Collage plots range from cross-sections, designed to tell a simple story, to highly detailed plots for extensive comparisons between wells. Interactive NMR analysis with echo train display, inversion, calculation of total porosity and bound fluid volume, and integration with standard open hole logs. 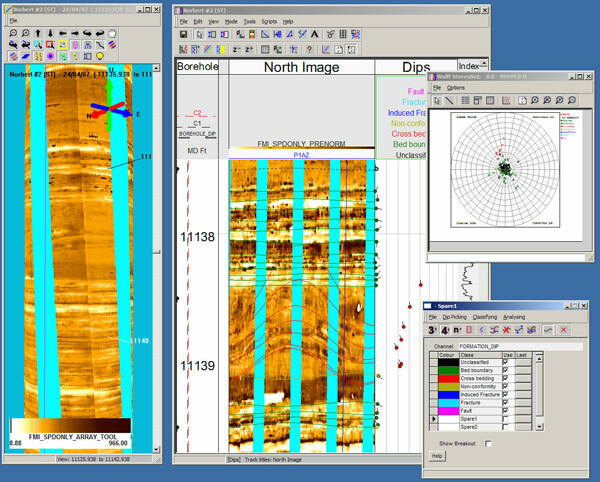 Nuclear Magnetic Resonance (NMR) logging is now established as part of the modern logging suite. Nevertheless, while logging hardware has made major advances, software for interpreting NMR data is not widely available. LogIC is one of the few programs available in the industry for dealing with NMR data, and perhaps the only one which does so comprehensively, and for tools from all the major logging contractors, both wireline and LWD. Calculation of total, clay bound and capillary bound porosities, with static, zoned or moving cut-offs. Multiple acquisition analysis, including T2-D maps. Fully interactive, side-by-side comparison with NMR core data. LogIC has a fully-featured image analysis toolkit. 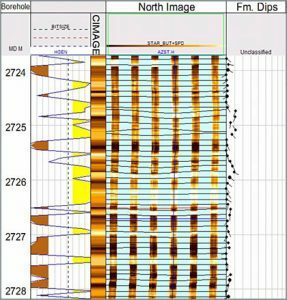 Originally developed in partnership with Schlumberger for the OBMI (oil-based imaging tool) and the ADN, we have extended the functionality to cope with wireline and LWD image logs from all the major logging contractors. Comprehensive image display at various orientations and normalizations, including dynamic. Image logs are an integral part of most modern suites, and LogIC allows the display and manipulation of all the common tools. On top of all the standard image log processing, integration of these high-resolution data with conventional logs adds terrific value to a standard analysis. Image log data pre-processing includes speed correction, filtering and re-processing of the contractor’s data with user-defined parameters. For display, comprehensive facilities include a number of industry-standard and user-defined colour maps, and several normalization options with user definable windows. Depending on the log, a range of analysis tools is available. Common to all is the ability to pick dips manually by clicking on the observed features, or matching templates. Dips so picked are immediately displayed as sine waves on the image, and as tadpoles in a separate log track. Dips can be classified and coloured by class. 2D-Breakout plots (based on multi-sample caliper tools) can be drawn in a dedicated track at regular intervals or drawn ‘on-the-fly’ as the pointer moves down the plot, creating a ‘movie’ effect. The image log data can be viewed in a 3D window along with the interpreted dip planes. The image can be rotated/zoomed in a variety of ways to highlight features of interest. The viewpoint can be set inside the wellbore to help see breakout in relation to the image data and the casing as you ‘fly’ down the well. Another specialist module in LogIC is full acoustic waveform analysis. This module is used primarily for shear wave transit time, which can be estimated using a number of algorithms. Full waveform acoustic is in active development with our users to increase the range and usefulness of the analysis. Acoustics are run in almost every well, and the value of acquiring and processing array data is only now becoming generally appreciated. Standard processing allows calculation of compressional, shear and Stoneley velocities, data which are used for standard formation evaluation, calculation of geo-mechanical properties and seismic applications. As usual in LogIC, the emphasis of the acoustic waveform analysis is on interactivity. LQC, filtering and validation are all essential preliminaries to successful processing, and point-and-click visualisation of waveform sets is the starting point, especially for dipole modes and in slow formations. 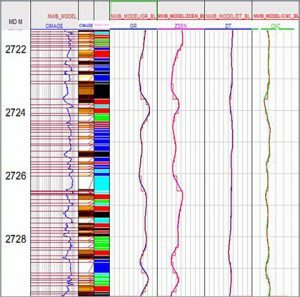 LogIC is a complete analysis, display and petrophysical database system for professional geologists, petrophysicists and engineers. Easy to learn and quick to use, LogIC nevertheless offers comprehensive functionality to cover the most taxing reservoir problems. Parameter files are associated with a well. Specifying the well means that the data set, analyses and presentations are fully defined. 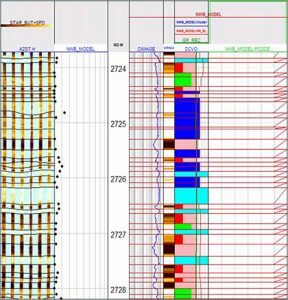 When a new well is drilled, methods and plot formats used on a nearby or analogous well can be quickly and effortlessly loaded for first pass analysis. In many cases the new data can be processed in minutes. Instead of simply storing the analytical results, LogIC retains, in the parameter files, the means by which those results are obtained. This approach makes it easy to track the processing strategy used for the well. In addition to the standard analysis methods, users can customise existing equations, or add new ones, using the “command interpreter”. The command interpreter operates both in addition to, and independently of, the normal analysis. It includes standard mathematical functions, conditional processing (IF statements) and access to many of the normal analysis procedures. In practice, the command interpreter allows users to perform virtually any analysis or data manipulation conceivable. Analytical results are presented as continuous curves of porosity, water saturation, and other information. LogIC furnishes zone-by-zone summaries of net-pay, net-to-gross ratio, hydrocarbon pore volume, as well as averaged channel data over the entire zone, or over the net-sand and net-pay intervals. The zone summaries can be viewed on screen, printed as hardcopy, or made an integral part of log-plot presentation. To enhance petrophysical interpretation in thin beds (i.e. beds whose thickness is of the same order as the resolution of the main wireline logs). To model 3-dimensional effects on tool response, allowing better interpretation in high angle and horizontal wells. It is estimated that very substantial proportion of the world’s remaining hydrocarbon reserve is to be found in thinly bedded formations so NWM is an important tool for the future, as well as the present. Essentially, a 3-dimensional model of the near wellbore is constructed from image logs. (The analysis will work without image logs, but it cannot be 3-dimensional.) Beds are identified and characterised using a combination of automatic and manual techniques.